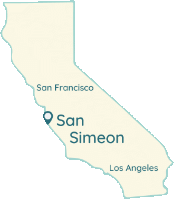 Plan your next trip around one of San Simeon's special events. Sunday, May 5th from 12-5pm Travel the Pacific Coast Wine Trail on Cinco de Mayo! Enjoy a unique "fiesta bite" paired with a special wine at each of the SIX wineries on the Trail. Food prepared by Boni's Tacos. Pairings included with purchase of tasting fee. No reservations. Questions? Please call 805.927.1625. Call to receive the best deal for your stay in San Simeon.